2018 DCSD Boys’ Track and Field Champions — SW DeKalb Panthers win 15th title. 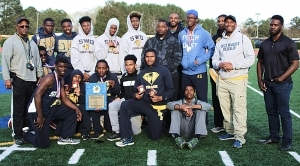 Southwest DeKalb regained the points lead on the next o the last event on Tuesday on the way to the Panthers’ 15th DCSD County Track and Field Championships title 90-69 over Stephenson. Senior Marcellus Boykin picked up his second individual gold medal of the meet with a win in the 200 meter dash (21.54) to pull the Panthers within 69-68 of Stephenson. Boykin had won the 100 meter dash (10.73) earlier in the day. Stephenson had no entry in the 300 meter hurdles and the Panthers took advantage as senior Barry Williams (41.37) and junior Jabez Long (41.79) finished third and fourth, respectively, in the even to garner 11 points for the team for a 79-69 heading into the final event (4×400 relay) of the day. Southwest had the title sewn up with two teams running in the final event and Stephenson having to withdraw due to an injury. The Panthers took second (3:21.71) and sixth (3:28.97) in the event for 11 more points to finish off the victory. The Panthers had led after the 4×100 relay win (41.79) by the team of Boykin, Trentavious Wiley, Justin Thomlin and Devin Brewington to go with victories by Nicholas Edwards in both the shot put (51-01.50) and discus (155-03.00) on the first day of competition. Stephenson’s second place finish was paced by senior gold medal winners Jordan Sessom (49.35) in the 400 meter dash and Justin Birdsong (14.78) in the 110 meter hurdles. 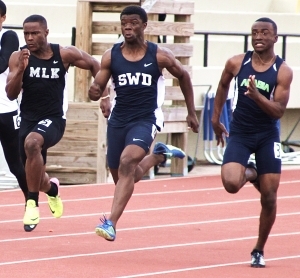 Arabia Mountain’s Jordan Barrow finished second in the 100 meter dash (10.79) and third in the 200 (21.76) as the Rams, last year’s runner-up, finished fourth. Miller Grove finished the meet strong in fifth place by taking gold in the final two events including sophomore Walik Robinson’s win in the 300 meter hurdles (40.47) and the team of Maurice McMillian, Jalan Williams, Jahdiel Oldfield and Chuck Shawn-Collins capped the day with a win in the 4×400 meter relay (3:20.51). Dunwoody sophomore Max Mowrer proved tough in the distance events with a sweep of the 1600 (4:33.56) and the 3200 meter (9:55.74) runs. Tucker sophomore Mohammed Koko took the 800 meter run in 1:58.94 as one of six participants that were not seniors to win gold medals. Individual winners from the field events included McNair sophomore Demarshae Travis in the long jump (21-06.50), Cedar Grove senior Keshun Byrd in the triple jump (45-07.00), M.L. King junior Coleman White in the high jump (6-02.00) and Lakeside junior Evangelos Katsoudas in the pole vault (11-00.00).